At 100, A French Newspaper Thrives — With No Ads And A Minimalist Webpage : Parallels Le Canard Enchainé is a fiercely independent weekly known for its incisive reporting and more than its share of scoops and bombshells. It continues to prosper with a format little changed since 1916. Frenchman Jean Yves Boyer buys a copy of the French weekly Le Canard Enchainé, which marks its 100th anniversary this year. It sells 400,000 copies a week and is profitable, though it has no advertising and just a bare-bones webpage. When a political scandal explodes in France, there's a good chance it's Wednesday. That's the day satirical newspaper Le Canard Enchainé hits newsstands. The fiercely independent weekly, known for its incisive and derisive reporting and more than its share of scoops and bombshells, turns 100 this year. 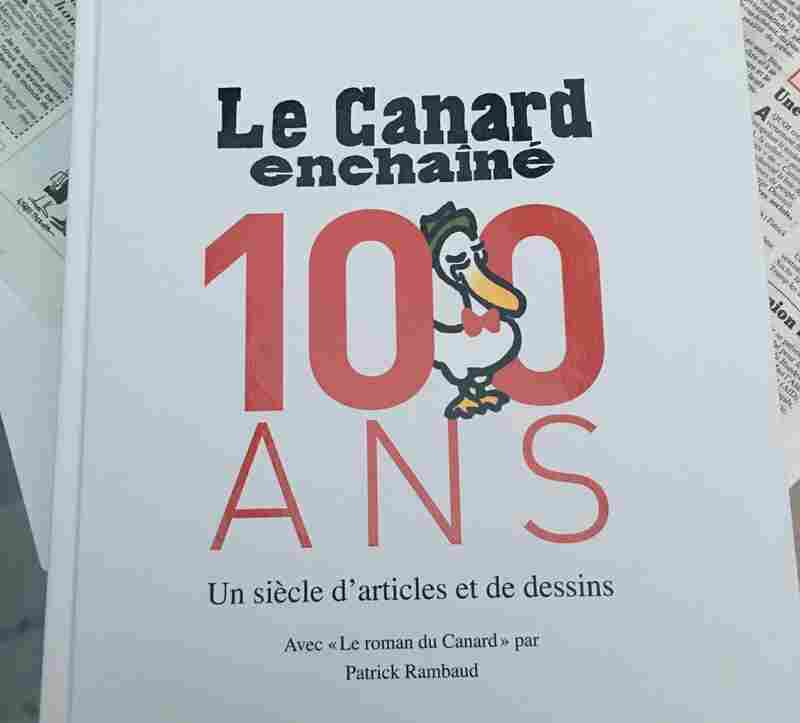 Despite the economic downturn, changing media landscape and a print press crisis, Le Canard Enchainé continues to do well. Remarkably, it takes no advertising and has only a bare-bones webpage that often just summarizes what's on the print front page. Yet it turns a profit on the 400,000 copies it sells each week. "My first reaction when I see something scandalous is to be indignant. My second is to laugh. That's more difficult, but it's more effective," said Maurice Marechal, who founded the paper in 1916, the bloodiest year of World War I. The weekly was founded to push back against two imposing forces in France at the time: the military and the church, says media consultant Jean-Marc Illouz. "The military was running the war and the clerical world was ruling consciences," he says. Erik Emptaz, a current editor at the paper, says that during the war, "the official propaganda was that German bullets would pass right through your skin and wouldn't even hurt you." Emptaz says the staff recently found a letter from a soldier writing from the trenches. At that time, Le Canard Enchainé was censored and white spots blanked out the forbidden news. "This soldier said there was more to read in the blank spaces of Le Canard Enchainé than in a whole page of Le Matin, which was the official newspaper at the time," says Emptaz, laughing. Emptaz attributes his paper's long, steady success to two things: its independence and its humor. "French newspapers today don't face censorship but they have huge economic pressure," he says. "Our independence comes from the fact that we don't have advertisers. So we can write anything we want about anybody." Emptaz says the Canard, as it is known, is neither on the right nor the left. "We are always critical of the power that has just been elected," he says. The newspaper asks its correspondents and cartoonists to treat things seriously without taking themselves seriously. "We never get outraged or say that something is scandalous," says Emptaz. "We have the facts and we simply stick to them and try to tell them in a funny and agreeable way." 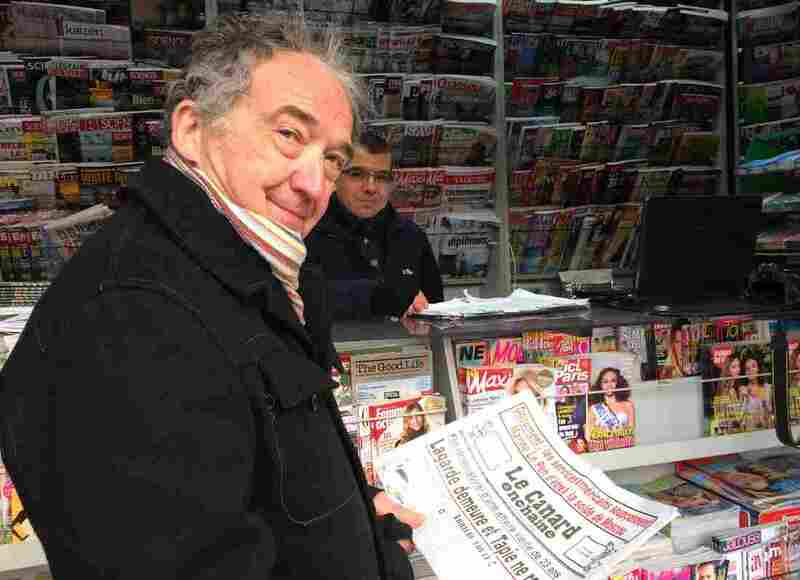 On a recent Wednesday afternoon, retiree Jean Yves Boyer was picking up a copy of the Canard at his local Paris newsstand. Boyer says the clever wordplay in the headlines often makes him laugh out loud. "When I want a bit of humor, but not just that, when I also want to be well-informed, I read the Canard," he says. "They have all the news and they're completely independent." In 2015, the Canard made around $3 million in profits. This, at a time when most newspapers in France are subsidized. Emptaz says profits are put into a reserve for the paper to keep operating if it falls on hard times. "We want to keep the Canard from falling into the hands of a financial group at all costs," he says, referring to the sales of two other major French dailies. Le Monde was recently bought by high-tech entrepreneur and media mogul Xavier Niel. Le Figaro is owned by the French industrialist family Dassault, makers of the French military's Rafale jets. Emptaz says the Canard's staff is a close-knit team of 30 or so reporters, and some freelancers. "We're like a big family. We work well together but we can also yell at each other," he says. A few years ago Le Canard Enchainé was sued by industrial group Bouygues for 9 million euros because the paper had reported that Bouygues tried to influence a government bid for the construction of a new Defense Ministry building. Bouygues lost. The Canard asked that the company pay its court and lawyer fees and one symbolic euro. One of Le Canard Enchainé's more famous scoops shook the very foundations of the French state. It concerned French President Valery Giscard d'Estaing accepting a gift of diamonds from Central African leader Jean Bokassa when he visited the African strongman in 1979. "It was just a little line in the paper about how Giscard had offered himself some diamonds while on a trip to Africa. But he took it badly and protested," says Emptaz. "So we dug deeper. And we had the proof." Many say the infamous Bokassa diamond affair cost Giscard d'Estaing the election. He was beaten by Francois Mitterrand in 1980. Emptaz, chuckling, says he'll never forget Giscard's words at the time: "I underestimated the force of derision." Emptaz says it's hard to predict what's going to be a big hit with the public. "We can publish a story about, let's say, telecoms monopolizing the market and pocketing hundreds of millions of dollars, and people hardly shrug," he says. But when the paper recently revealed that President Francois Hollande's hairdresser earns $12,000 a month (an enormous sum for the French), the paper sold in hours and had to go to reprint. Le Canard Enchainé is different from fellow satirical weekly Charlie Hebdo, which is not generally focused on news and often publishes cartoons for their shock value. Charlie Hebdo became known around the world when Islamist radical gunmen attacked its Paris offices in January 2015, killing 17 people. The attackers said they were revenging its caricatures of the Prophet Muhammad. Charlie Hebdo regularly caricatured religious leaders such as Jesus, Moses and Muhammad. "The Canard is a paper with sensibility and our stories have to be backed up by real news," he says. "We're not just going to mock Islam or the Catholic Church for no reason." Still, the attack on Charlie Hebdo had a huge effect on Le Canard Enchainé. One of the cartoonists killed at Charlie Hebdo also drew for the Canard. Emptaz says today there are several perimeters of security around the newspaper's downtown Paris offices. And the staff takes threats more seriously than before the attacks on Charlie Hebdo. "Once, we got a letter from a guy who said he was going to decapitate us all with an ax," he says. "So we wrote that it wasn't every day you get the chance to laugh your head off. The police came immediately and told us we had to get serious." The paper costs 1.20 euros ($1.50) and polls show that the habit of reading Le Canard Enchainé is something that that is passed down from one generation to another. Media consultant Illouz says despite 24-hour news cycles and flashy, cable networks, the plain little Canard Enchainé remains a respected institution in France. "Who would believe that an eight-page, nonglossy newspaper could still be such a hit?" he says. The original version of this story said Le Canard Enchainé had no website. The newspaper has a minimalist webpage that summarizes articles and offers contact information, but it does not provide full articles. Correction: The name Dassault was previously misspelled as Dassaut.